I have not had time yet to thoroughly examine the thousands of items I purchased at the McMurtry auction. This nugget surfaced randomly while moving a pile of miscellaneous pamphlets and catalogues. Who knows what other goodies await? John Howell. TYPED LETTER SIGNED FROM BOOKSELLER JOHN HOWELL TO FELLOW BOOKSELLER AND BIBLIOGRAPHER ROBERT E. COWAN, JULY 20, 1917. 4to. Included with the letter is Howell's mimeographed 32 page typescript catalogue containing 407 items for sale. The first nineteen pages describe 265 titles from the Robinson collection, the rest of the volumes are from Howell's stock. 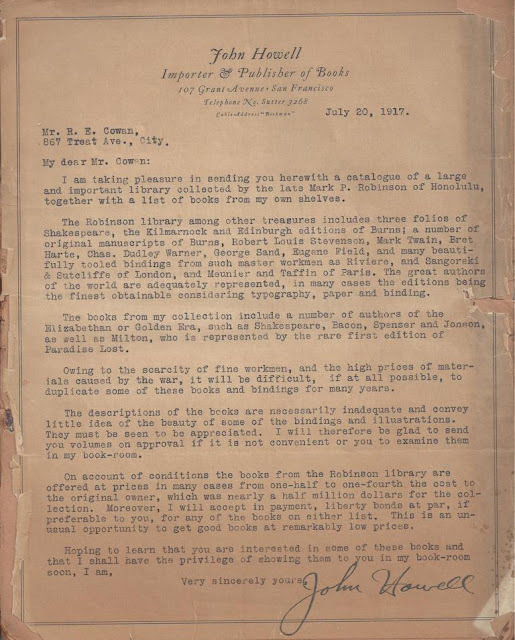 Howell writes Cowan that he has acquired a large selection of fine books & manuscripts from the library of Honolulu businessman, Mark P. Robinson (1852-1915). Robinson had a predilection for English literature and fine bindings. This acquisition was fairly early in Howell's illustrious bookselling career and must have been a major coup even with WWI in progress and the book trade in the doldrums. Howell writes, "On account of conditions the books from the Robinson library are offered at prices in many cases from one-half to one-fourth the cost to the original owner, which was nearly a half million dollars for the collection. Moreover, I will accept in payment, liberty bonds at par, if preferable to you, for any of the books on either list." Mark P. Robinson's good but now forgotten collection was scattered to the winds. A privately printed catalogue had been issued some years before: Catalogue of the Library of Mark P. Robinson, Esq. of Honolulu. Philadelphia: 1909. Anderson Galleries in NYC auctioned off other material from the library in 1918 (McKay 7928, 7956). See Dickinson's Dictionary of American Antiquarian Bookdealers for more details about Howell and Cowan.